Import charges levied on basic commodities at the Anchorage port could increase fivefold or more if the municipality is forced to rebuild decrepit shoreside infrastructure on its own dime, according to an analysis released last week. 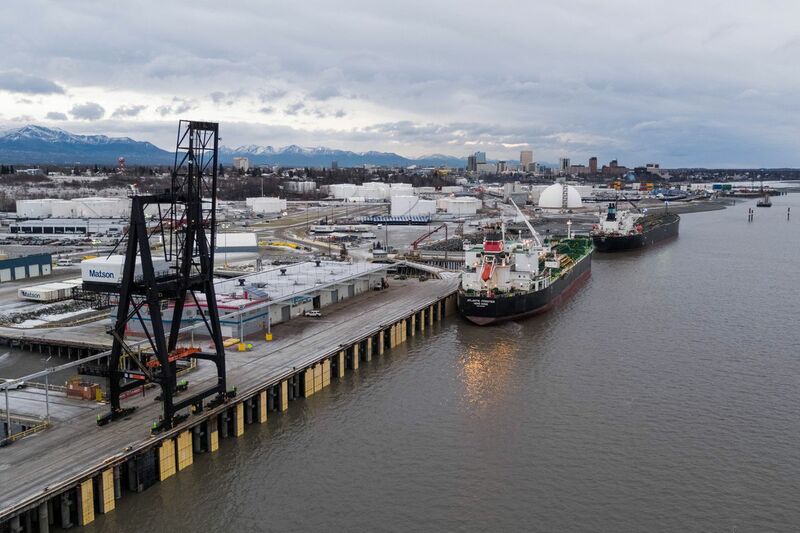 The analysis looks at how much Port of Alaska tariffs on refined petroleum products and cement would have to be raised to cover the cost of borrowing $200 million to pay for replacing the port’s petroleum and cement terminal. It was prepared by the Virginia-based economic consulting firm Parrish, Blessing and Associates Inc. and presented at a Thursday Port Commission meeting. Municipal Manager Bill Falsey said in a follow-up interview that the municipality will have to sell $200 million in revenue bonds in less than a year to stay on the construction schedule for the petroleum cement terminal. The cost for a new petroleum and cement terminal has been pegged at $223 million. About $20 million in funds left over from prior port construction appropriations would fund part of the work and the bonds would pay for the rest, Falsey said. The terminal must be done first in order to free up space for when the cargo docks are rebuilt and must be done while they are still being used by TOTE Maritime and Maston Inc., which provide container and roll-on, roll-off shipping services to Anchorage, according to Port Director Steve Ribuffo. It is also on the oldest part of the dock structure, he said. Some of the pile-supported docks have been in place since 1961 and have far exceeded their initial 35-year design life as the saltwater they stand in has gradually taken its toll and corroded the steel support pilings to the point where many resemble Swiss cheese. The port currently charges a tariff of 15.7 cents per barrel on petroleum products, which breaks down to 0.38 cents per gallon. Those rates would need to be increased by 45 percent per year until 2023 — when they would reach $1.01 per barrel and 2.4 cents per gallon — to cover the debt service on the bonds, according to the analysis. For cement, the tariff is currently $1.61 per ton. It would similarly increase 39 percent per year and hit $8.30 cents per ton in 2023. Falsey said the municipality believes the market price for cement is about $155 per ton now. The tariff rates would stabilize after 2023, according to Ribuffo. The bonds would be 40-year revenue bonds calculated at 4.1 percent interest, he said. Falsey said the state could either approve a general obligation bond sale to pay for the work and avoid the tariff increases or agree to backstop the port revenue bonds. The state’s guarantee would likely lower the interest rate on the debt somewhat. Federal funding has also been sought — although unsuccessfully to this point — given the Department of Defense classifies Anchorage as a strategic defense port and therefore requires large amount of dock space to be available for rapid deployments from Alaska’s military installations. The tariff plan is a way to limit cost increases to pay for the petroleum and cement terminal to the customers that use it; similar plans could be used when the rest of the port’s infrastructure is finally reconstructed. Petroleum and cement tariffs generated $14.6 million for the port in 2018 and the rate hikes would lead to more than $24 million in annual revenue by 2023 if they don’t drive business away. Falsey said port and city officials will spend the next month talking with the customers that use the terminal to try and determine what impacts the tariff increases could have on business. The Port Commission is tentatively set to make its recommendation on the tariff changes to the Anchorage Assembly in mid-March; the Assembly would make the final decision. The ultimate fear is that the changes could slow the petroleum and cement business at the port to where there wouldn’t be enough revenue generated to pay for the bonds. The prospective tariffs could also have larger implications across the state economy from higher fuel prices, such as deterring cargo business at Ted Stevens Anchorage International Airport. Cargo carriers flying from Asia to the Lower 48 stop in Anchorage — and make it one of the busiest cargo hubs in the world — because it is slightly cheaper for them to haul more cargo and refuel here than it is to carry more fuel and fly over Alaska. Cargo industry experts say the cost difference is usually pennies on the gallon for jet fuel, so the potential impacts of the tariff changes is unknown at this point. “It’s pretty difficult to model that and we don’t have access to that kind of information that we would need to know,” Falsey said of how the suggested tariffs would impact some port customers and the broader economy. He said city officials are hopeful those customers will be forthcoming with the information they need to make an informed decision and help them minimize the impact of the tariff changes if they are made. Calls to several of those customers were not returned in time for this story. Regardless of those impacts, the work needs to be done, Falsey stressed. “Our view is that we need to have the new petroleum cement terminal and we are increasingly uncomfortable with the terminal we have rotting away into the ocean,” he said. The first port rehabilitation project, Port of Anchorage Intermodal Expansion Project started in 2003, was intended to greatly increase the size of the port but it came to a halt in 2010 after extensive damage to the Open Cell Sheet Pile being installed to support the new docks was discovered. That work, much of which has been or will be removed as part of the new plan, cost roughly $300 million from a consolidated pool of local, state and federal dollars. There was $128 million left when the expansion project stopped and Ribuffo said there is about $60 million left now after years of design work and some small-scale rehabilitation. The remaining money is being spread amongst the several phases of the port modernization project, he added. Anchorage officials for years have been trying to gain support from state officials and lawmakers to help pay for the port work. The Anchorage Assembly officially changed the name of the city-owned port in 2017 from the Port of Anchorage to the Port of Alaska in an attempt to highlight its importance statewide and possibly drum up support for funding the rebuild. It’s estimated that 90 percent of the goods destined for delivery across mainland Alaska are imported across the port’s docks. It is the epicenter of logistics and one of the foundational elements of the state’s economy. Funding for the port modernization project has been the municipality’s only capital request to the state Legislature since Mayor Ethan Berkowitz took office in 2015. Those requests have recently been in the $300 million range, although cost estimates for the total port modernization project have gone from about $500 million in 2014 to nearly $2 billion currently. The most recent cost projections from private consultants are for a 75-year design life and constructing one cargo dock to withstand shaking at least as severe as the 9.2 magnitude 1964 earthquake, according to Falsey. Those parameters were chosen in 2014 and are still flexible given design work on the rest of the port is ongoing. “We are going to pick up all of those assumptions in the face of now this revised $2 billion number and say, ‘Is this what we can afford? Is this what we want? What do those assumptions cost us?’” Falsey said.